Singer 9960 Quantum Stylist Review (Apr. 2019): Is It Right For You? Singer 9960 Quantum Stylist Review: Is It Right For You? The Singer 9960 Quantum Stylist 600-stitch computerized sewing machine is excellent for beginners and experienced sewists. It has many cool built-in features that save you time. Feel free to click on the subheadings in the quick navigation below to read through this Singer 9960 review. Does this machine do embroidery? What about the feed dogs mechanism? What about the speed and speed control? How powerful Singer 9960 is? Is it suitable for clothing? What fabrics can you sew with this machine? What about other home projects? How good is the lighting? Is it a metal machine? Can this do heavy duty sewing? Is this a high shank or low shank sewing machine? Can this machine serge seams? Can I connect this machine to my computer? Does it really have 600 built-in stitches? Can you change the size of the built-in stitches? Does the automatic tension mean I can’t adjust it? Is it difficult to use the automatic needle threader? Can it sew with twin needles? This is an excellent machine for beginners. It’s easy to set up with many automatic features including auto thread trimmer, auto needle threader, auto stitch width and length adjustments and more. You don’t have to focus on anything but your sewing. The other great thing about 9960 is that it will grow with your skills. It’s well made and will last a long time. The interface is very intuitive to use. Singer 9960 sewing machine comes with 19 different presser feet. Plus you can buy additional ones. Whatever home sewing project you want to sew, you will have the tools to do it. Yes, 9960 from Singer can do embroidery. It comes with darning & embroidery foot and many decorative stitches. However, it wasn’t designed to make patches or do large logos. And it doesn’t hook up to a computer like a lot of the high-end embroidery sewing machines. But you can do a lot of decorative embroidery on household items like napkins and tablecloths. You can also decorate jeans or a denim jacket. You can also drop the feed dogs and use the satin stitch to create your own embroidery using free-hand sewing. Most Singer 9960 Quantum Stylist sewing machine reviews focus on the number of stitches. And I’ll be honest. 600 is massive at this price point. And it is very easy to setup and use. We will go more into that further down. What the Singer 9960 reviews don’t tell you is that Singer uses a different motion for their feed dogs on the Quantum Stylist 9960. It’s called box feed motion. They claim it allows for a more consistent feeding of the fabric because the feed dogs are always in equal contact with the project and the presser foot. Most sewing machines use a typical arc motion. This is why experienced sewists look for “walking feet” so that the top and bottom fabric pieces go through the needle at the same time. On most sewing machines, the top piece of fabric feeds through more slowly than the bottom. So unless you’re using this to ease in a set-in sleeve to the body, you will want a machine that either has better feed dogs for even feeding or a walking presser foot. It’s not perfect, by the way. It’s better than many others at this price point. You may still want to use a walking presser foot if you sew a lot with knits. One quick hint is to ensure you’re using a ballpoint needle and the correct thread for the best results. The Singer Quantum Stylist provides fast sewing at 850 stitches per minute. There’s also a slider bar for speed control if you want to ensure that your maximum stitch speed is slow for thick projects. It uses a DC motor. That allows you to have a more consistent source of power whether you’re sewing on light silks or heavy denim. A big test for sewing machines is how they handle humps in the fabric. For example, if you just want to hem some jeans, you will have that hump where the seams all meet up. 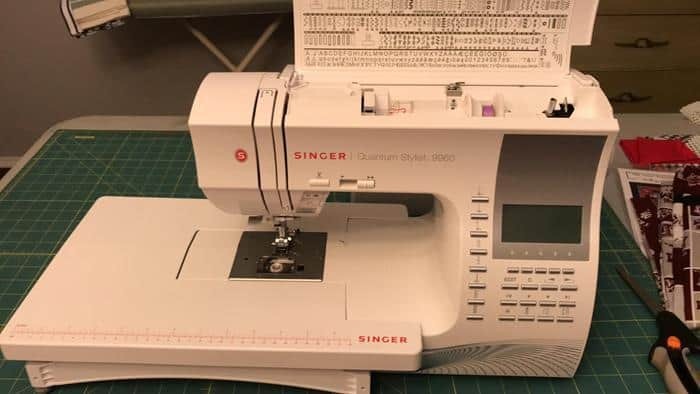 The Singer 9960 Quantum Stylist has the strong, consistent motor, and you can lock the hinge on the presser foot, so it won’t lose touch with the fabric when sewing over the hump. This Singer 9960 sewing machine is great for quilting as it’s designed to go through high loft batting. There are many built-in decorative stitches which are useful for quilting. You can elongate the stitch if you want to do varying sizes of scrolls or ivy along your quilt. Another great feature on the Singer 9960 is that you can lift the presser foot to an extra-high position to make it easier to get large quilts in and out of the machine’s sewing area. If you’re interested in sewing clothing, you will be able to create many couture details. You can create professional seams with two lines of stitching. There are 13 different one-step full automatic buttonhole styles. And using needle position, fine-tuning stitch length, and the ability to pivot with the needle in the down position easily, you can get crisp and clean lines on anything you’re creating. You can sew lightweight fabric like silk, georgette, voile, etc. To get the best result be sure to use the 9/70-11/80 size needles and cotton or silk thread. It can also sew leather with the leather needles. You can also easily sew the medium weight fabric like linen, satin, velvet, gingham, etc. with the needle size 11/80-14/90. If you are working with knits, swimwear, jersey, tricot and sweatshirts, you'll be able to handle those on this machine with the polyester thread and green shank 11/80-14/90 sized needles . This machine can handle heavyweight fabrics like tweed, corduroy, denim with the 14/90-16/100 needles. We talked about the motor. You can use the Singer Quantum Stylist 9960 to make a wide variety of home decor. You could make slipcovers for your couch and coordinating throw pillows with corded edging. You could sew draperies with sheer linings. And you could sew a tablecloth with decorative embroidery and matching napkins. Plus, if you’d like your own bags for the supermarket, you could sew sturdy shopping bags with oilcloth. ● Easy to load drop-in bobbin with a clear plastic cover. You will be able to see precisely how much bobbin thread you have left before starting a seam. ● An easy threading system. You just need to put the thread through the simple slots, and then you’re ready to use the automatic needle threader. ● Automatic thread tension is wonderful for beginners. No need to adjust the thread tension. Experience sewists can also adjust the tension if they want to take control. 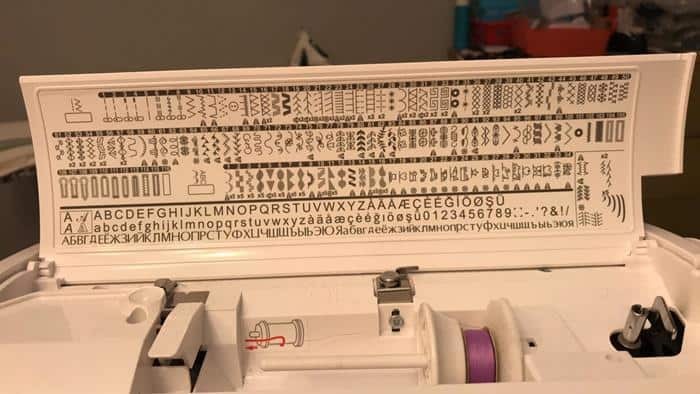 ● 600 Built-In stitches with a stitch reference chart attached to the top of the machine. You can easily see the stitches on the LCD, but it’s also nice to see all of them when you’re trying to choose. ● An add-on extension table provides a larger sewing area for bigger projects. ● Stitches are neat and well formed. This machine does the most important thing really well - a good straight stitch. ● You can run the machine with the foot pedal or the start/stop button on the machine. ● The LCD has a brightness control. That is a pro. The con is that the brightness control is a wheel near the bobbin winder, and people often accidentally turn it, so the display goes very dim. ● This isn’t a great embroidery machine. The letters are not very big and do look choppy. You need a contrasting thread to see the lettering. And unfortunately, you can’t change the size of the letters. So don’t buy if you intend to do a lot of monogramming or logos. ● The presser foot pressure is not adjustable. You have to trust the machine to make adjustments for you. It weighs over 20 pounds, so it’s not considered a featherweight machine. But it’s not difficult for most people to lift and move around. At least it’s not a fifty-pound machine like some of the very old machines were. The Singer Quantum 9960 has two LED lights to illuminate the needle area. It allows you to see what’s going on. And since they’re LED lights, they'll last longer and are bright. The frame of 9960 is made of heavy duty metal. It holds all of the mechanical pieces firmly in place, so it will provide skip-free sewing and last longer. The machine is designed for home sewing projects. It can handle home decorations with the right speed control, presser foot and needle. You can hem jeans. But it was not designed to be a heavy duty nor an industrial machine. You can do some heavy duty sewing carefully, but if you need to do a lot of it, then this is not the right sewing machine for you. This is a low shank sewing machine. If you want to purchase a third party presser foot, make sure it’s for a low shank sewing machine. Some actually will come out and state that it will work on a Singer sewing machine. No. You would need to purchase a serger for that. No, the Singer Quantum 9660 does not have a port that you can use to hook up to a computer. You cannot create and import designs. You are limited to the built-in stitches. You can elongate stitches up to five times their default size, so it looks as though there are more stitches than just the 600. That kind of control puts you in the creative driver’s seat. It’s fun to just play around with the stitches. Yes, You can adjust the stitch length and width of basic stitches. You can also increase the size of some of the decorative stitches. Some of the decorative stitches like the alphabet cannot be increased in size. No. You can adjust the tension if you feel the machine is not detecting properly. Whether you're a beginner or a professional, you’ll know if your stitches are puckering. You can go in through the main LCD and find the function to adjust the thread tension if you need to. No. You may want to watch some videos on the Singer website showing how to use it. And also, please remember to have the needle in the correct position so the hook will pass through the eye properly. Yes, it can. There’s a separate spool attachment so you can use two spools of thread. If you love the look of uniform hemlines, this is for you. You can sew the two hemline stitches exactly the same. You can mimic the look of ready to wear clothing using the twin needles. For example, many jeans have two rows of stitches on their seams. It used to be used for reinforcing seams that were used the hardest. Now it’s just decoration. You can also use the twin hem stitches on t-shirts and tops. This is a versatile and flexible machine. You get so much for the price that it’s a great bargain. Perfect for beginners for the price, and it will grow with your skills. You won’t outgrow this machine. And one more cool feature, before you go. The interface allows you to do mirror imaging. So if you do a scroll in one direction, you can mirror and embroider a scroll in the opposite direction. You don’t have to turn the fabric around and guess where to start and end the stitches. So the bottom line is that this machine is one of the top sellers for a reason. Here is how this machine compares with the 9980 and 9985.